2012 starts with a “rollercoaster-climate”! Icy temperatures up to -12°C in Janurary/February did not allow us to work outside. Suddenly in March a sunny spring arrived with really warm temperatures, and there was bud burst end of March! The earlier bud burst the earlier harvest is, hopefully not! Gladfully we had a contrary weather period in April with cooler temperatures and rain. Growth slowed down and the soil could store enough water for the summer months. And for us no heat stroke at vintage! Mid of May, for the first time temperatures around 30°C arrived us. The vines grow fast and we have to hurry up to manage all the vineyard work in time, removing excessive shoots from the plants and remove all shoots from the trunks. Compared to the year 2011, flowering starts three weeks later. 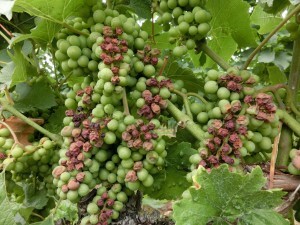 Cooler weather during flowering means a reduced fruit set. We like that, naturally less fruits on the vines! Hot days end of June bring the flowering to an end. But thunderstorms and rain falls are not missing. 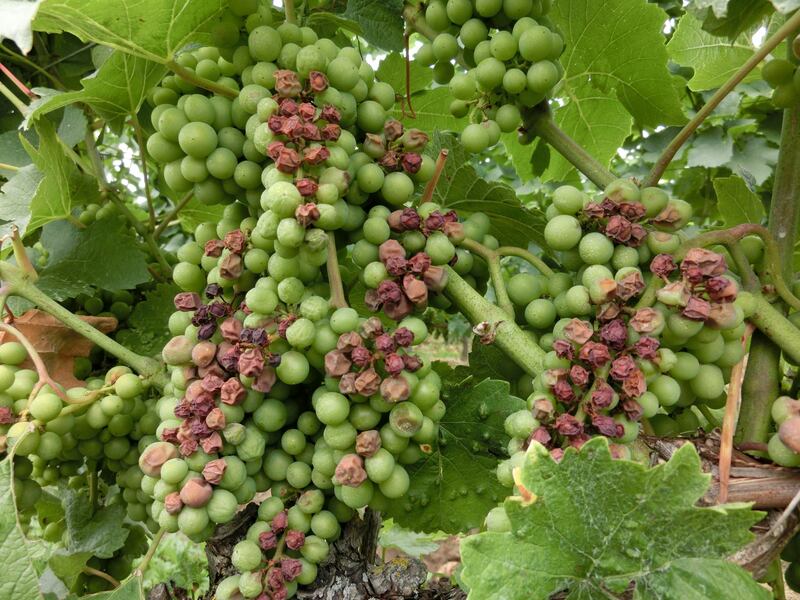 Some vintners already claim about fungal diseases in their vineyards. Our vines are healthy and vital. We were right in time with deleafing our fruit zones. So you give the green little grapes the chance to build up a resistance against sunburn. The warm and humid weather carried on in the first two July weeks. Growth of the vines is fast. The result of the contrary weather at flowering are vineyards in different maturity stages depending which variety or which section. Some have less fruits and then there are our shocking Müller-Thurgau sections offering way too much and big grapes. There we started with the green harvest. End of July, finally the real summer arrives. pure sun without rain. The first coloured Pinot Noir berries can be seen. In August summer continues with nice cool temperatures at night. Best conditions for a smooth and equal maturity of the fruits. Vineyards are all healthy. Due to our strict vineyard management we have no problems with fungal diseases. Impressum / Imprint . Datenschutz .